The Philosopher Alfred Whitehead once said that everything anyone has written in Western Philosophy is little more than a footnote to Plato. We are fortunate to have as the leader of our Platonic studies someone who is fluent in ancient Greek and who is currently involved in the preparation of a new translation of the whole of Plato’s work. A Day with Plato is held three times a year, alternately at Hyde Park Towers, CBD and Mahratta, Wahroonga. The event is always on a Sunday, 9am-3pm. The approach taken is to read and discuss the text with a view to following the argument rather than assessing whether the views expressed are correct or otherwise, or whether my views are correct or otherwise. All that is required, is an enthusiasm to go beyond what we normally regard as the limits of our understanding. Participants find these events stimulating and refreshing. Each day begins with a briefing to put into context the materials to be studied and includes morning tea and lunch in very good company. From Monday 12th August (p.m.) to Thursday 22nd August (a.m.), 2019. Plato says in The Laws that without wisdom and the other virtues, a society will never obtain the wealth and other worldly goods that are so important to people today. The practical message from Plato is that the ills by which society is beset today can only be remedied by wisdom and philosophy. What does this mean, in practice, in today's world? What relevance does the great enquiry of Plato's Laws have for the world we live in? These Plato events are primarily intended for students of the School attending philosophy groups, who are meditating and have attended at least one residential weekend or week. For more information about the event and accommodation click here. If you are interested in attending please download the Booking Form here. Your completed Booking Form must be submitted to your School Representative, Chris Heeks. We are now embarking on the study of Plato’s best known work, The Republic, over 10 consecutive meetings. Each meeting will examine one book of the text. The Republic is an investigation into the nature of justice. 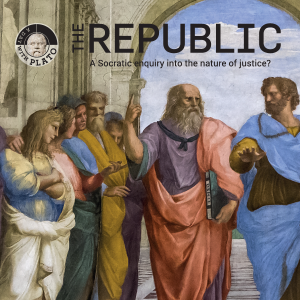 The Republic has proven to be one of the world’s most influential works of philosophy. Much of the subject matter we will enquire into are underlying principles fundamental and relevant to contemporary issues in politics and current affairs. To examine this Plato presents a view of an ideal state, and has to deal with many other subjects to justify and explain his model. These subjects include what has become known as the Platonic Theory of Forms, Immortality of the Soul, the Philosopher King, Plato’s Cave, Five types of Government, and more. Is justice more profitable than injustice (continued)? Why do the unjust wish to appear just? The story of the ring of invisibility, moving the discussion to universals based on an examination of an ideal state. The natural divisions of an ideal state; the role of government, and the education of the governors. The role of literature in education, and selecting the right material. Plato continues to investigate the principles governing the education of “the guardians”, including the type of literature, music and art that would best provide for the full expression of virtue in their lives. Book Three also discusses the need for social mobility based upon merit. The ideal state is now established and as per the original plan in founding a state, it is possible to examine what justice itself is and to apply what has been discovered to the individual situation. Happiness for one part is not the aim but happiness for the whole. Divisions of rich and poor need to be amicably dissolved for the real power of the state is found in unity. This is the shadow of justice. True justice is about the inner man and is concerned with what creates a unified being. Further exploration of the qualities of the leaders of the ideal state. Is the ideal state possible? The Platonic Theory of forms. Forms as absolutes (such as justice, goodness, Happiness). The Philosopher is the best ruler for the ideal state. More on the Philosopher as a ruler and the difficulty of producing a Philosopher ruler. The Philosopher ruler must possess Goodness, Justice, Beauty etc. Goodness is required to see the goodness of Justice and Beauty. The intellect and Plato’s divided line. Dialectic. Plato’s cave; the role of mathematics in the education of the leader; education of the leaders, from early childhood to age fifty. The breakdown of the ideal state; and the four types of unjust state (timocracy, oligarchy, democracy, and tyranny); how the type of state relates to the type of people; descriptions of the timocracy, oligarchy and democracy, and their relationships. The tyrant, is the most miserable of men, a slave to his own desires; the just man is free and the happiest of men; each person must learn to govern himself using reason. The role of arts in society; the role of art in the ideal state; the immortality of the soul; justice and the immortal soul; the myth of Er. Plato’s cave and the role of mathematics in the education of the leader.This will be held at Hyde Park Towers, CBD, arrive 8.30 and finish 3pm. Lunch and Tea Breaks are included in the ticket price. Sunday 23 June 9am.